12. Christmas Tutorial for Piano Beginners and Intermediates! 20. Between Pianissimo and Fortissimo. Improving the Piano Dynamic Range. 24. 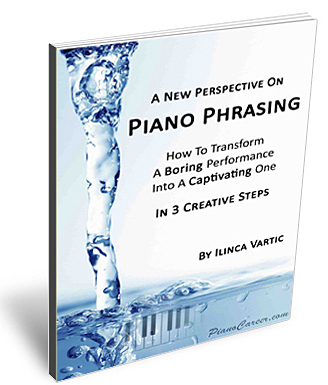 My Piano Coaching Program at PianoCareerAcademy.com Is Officially LIVE! 25. Take A Deep Breath – Relax Your Wrist! 26. Coming Soon! A Piano Community Like You’ve Never Seen Before! 27. Have an Amazing, Music-Filled Holiday Season!!! 36. Ask Me a Piano Question! 42. Constructive Tip for Piano Beginners – Avoid Staccato! 44. The Modern Health Myths – Can They Affect your Musical Career? 46. How to Deal with Piano Practice Related Hand Injuries and Muscle Pain? 48. How to Compensate Your Daily Piano Practice Routine?